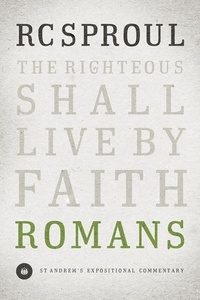 Throughout church history, the study of the book of Romans has been pivotal to understanding Christian life and doctrine. Convinced that “Paul’s fullest, grandest, most comprehensive statement of the gospel” is just as vital today, R.C. Sproul delivered sixty sermons on Romans from 2005 to 2007 at Saint Andrew’s, where he has pastored for more than a decade. Sproul’s passage-by-passage expositions will not only enrich any preaching or teaching ministry but any thoughtful study of this weighty exposition. With each page I can hear Sproul thundering away in the pulpit, "the righteous shall live by faith!" Sproul teaches with such clarity that the reader is made to feel as if he were seated in St. Andrews Chapel and experiencing this exposition first-hand. This work is thoroughly sanctifying, timeless, and is counted among my most treasured volumes. Thank you Dr. Sproul, thank you. No "Dust Bunnies" on This Commentary! This is the kind of commentary I have been waiting on forever! R.C. is an elegant teacher and advocate for Christian growth. I cannot wait for "John" and hope that the one after that will be "Hebrews!" Sproul's writing style reminds me of sitting across the table from a wise old friend who patiently answers all your questions AND shares their experiences - things that give them strength and hope.